Keep The Cash Flow, Lose The Work! Maybe you found the business is just "not for you" or you are too busy in another career. Perhaps you moved out of the area, changed careers or retired. Become a "Professional Real Estate Referral Consultant" and keep the income flowing. By turning your leads into referrals, your clients work with the best agents in the business and you get paid. Everyone wins! Great Income for Inactive Agents just for sending leads! Inactive Agents, busy with another career, can still be a "Professional Real Estate Referral Consultant". Changing Careers or Moving out of New York? Make money from your leads without the work! Unlicensed? You can make money without learning the tips and tricks of the PRO'S. Expire license? New York will still let you renew with very little effort. Active Agents, referring Inactive Agents to DCG, get those referrals in their Market Area. Owners/Managers get a financial return on Agents even after they leave the business. You agree to act as an Independent Contractor limiting your license activities to sending referrals through DCG. You agree to abide by the DCG Policy & Procedures. Our Only Business Is Referrals! Droz Consulting Group LLC, was created with the idea of providing inactive agents a way to profit by their time in the business. By becoming a"Professional Real Estate Referral Consultant" we provide a zero cost way to earn referral fees while offering the highest splits in the industry. We send our referrals to the best people in the business. Droz Consulting Group, LLC was founded by Thom Droz who grew his Nationally Franchisee Real Estate company into the dominate company in his market. Thom is well known for his use of technological advances and bringing them to effective use in the Real Estate industry. 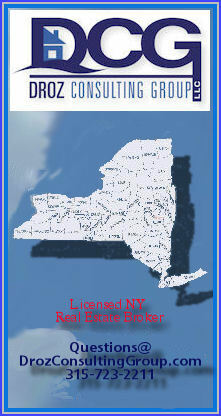 New York Licensed Real Estate Broker: Droz Consulting Group, LLC, 9163 Butler Road Sauquoit, NY 13456 © 2009 All rights reserved.